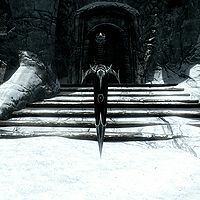 If equipped, guards may comment on the dagger, asking "Who did you have to kill to get that blade?" MiraakDB and KarstaagDB are immune to the razor's instant kill effect. 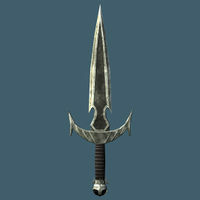 The chance that Mehrunes' Razor will instantly kill an enemy should be 1% according to a comment in its script, but due to an oversight it is actually 2/101 which means that the real chance for an instant kill is just under 2%. Mod Notes: Confirmed through Creation Kit. This weapon is not affected by any smithing perks. This issue has been addressed by the Unofficial Skyrim Special Edition Patch; It causes the weapon to benefit from the Daedric Smithing perk. This page was last modified on 29 November 2018, at 16:34.